African music and dance demonstration by Dr. Habib Iddrisu and his Dema Performing Ensemble. Come and join us and also learn more about an opportunitu to travel to Ghana in the Summer. 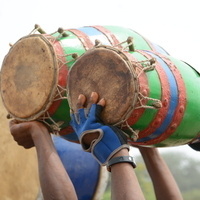 This program immerses the student in a variety of music, dance, storytelling traditions across several regions of Ghana. The demonstration uses the concept of a "total performance experience" thus, the combination of music, dance, and storytelling, with the intent to educate, probe, teach, learn and to entertain.